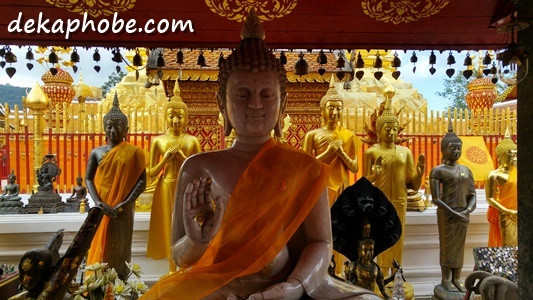 Chiang Mai, a beautiful city located in Northern Thailand, is home to around 300 Buddhist temples. 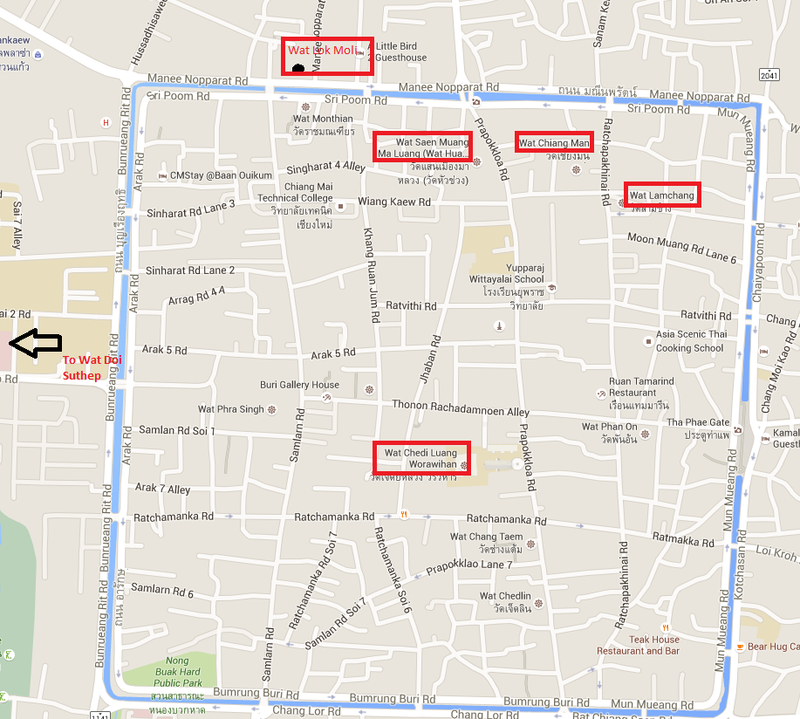 As our guesthouse is in the Northwestern side of the walled city, it was easy for us to visit some of the temples or wats. Wat is Thai for temple and Chedi is Thai style stupa. 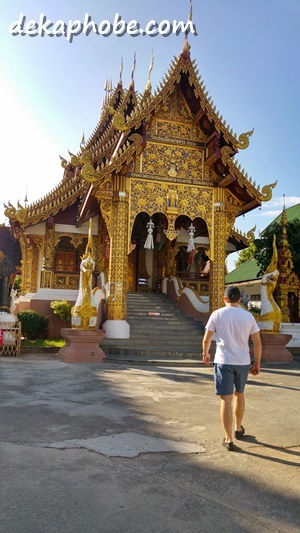 I must note that all the temples are still used as places of worship, so I highly suggest that you wear decent clothing (no shorts and sleeveless tops), but since Chiang Mai can get humid and wearing sleeveless tops is more practical, bringing a shawl or sweater is a better option. 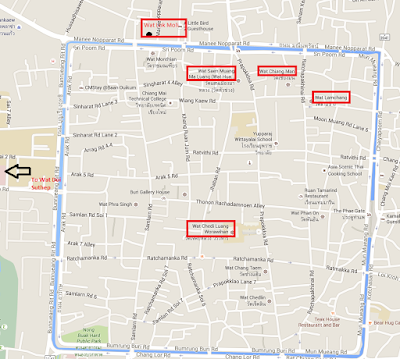 Here are the temples the boyfie and I were able to visit during our stay. Except for Wat Doi Suthep, all of these temples can be visited on foot (especially if you're staying within the walled city). 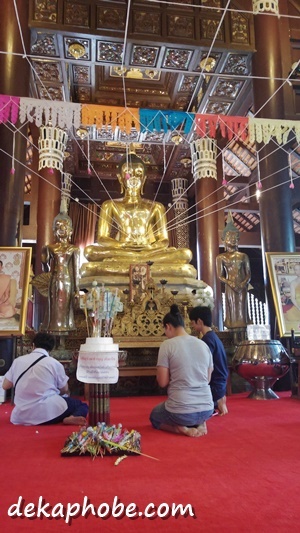 Wat Chedi Luang is the most popular wat located in the center of the walled city. It was the largest chedi we have visited. 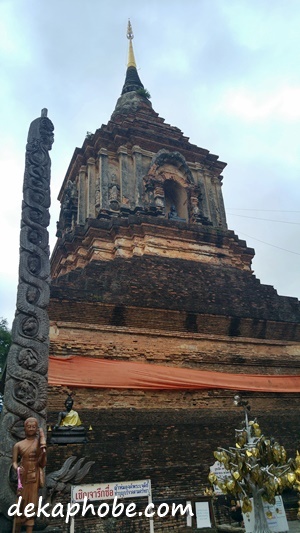 It is also known for housing the city pillar of Chiang Mai. What makes this Wat more interesting is the waxed figures of the former monks who served in the temple, but I didn't take a photo because it seemed disrespectful. Wat Chiang Man is the oldest temple in Chiang Mai, having built around 13th century. 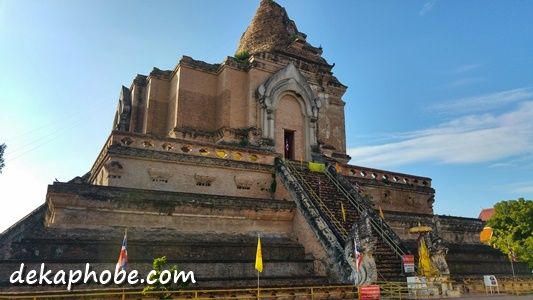 It used to be the residence of King Mengrai, the founder of the city of Chiang Mai. The chedi of Wat Chiang Man is the grandest looking chedi that we have seen, with elephant sculpture surrounding the lower part of the chedi. Wat Lamchang is a small temple located near Wat Chiang Man. Lam Chang means "shackled elephants" as the temple is decorated with elephants. 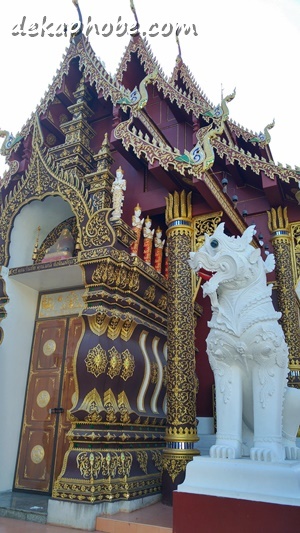 Another small temple with beautiful architecture is the Wat Hua Kuang. Though it was said to be built around 1500 but the structures that stand in the compound are newly-built and intricately designed. 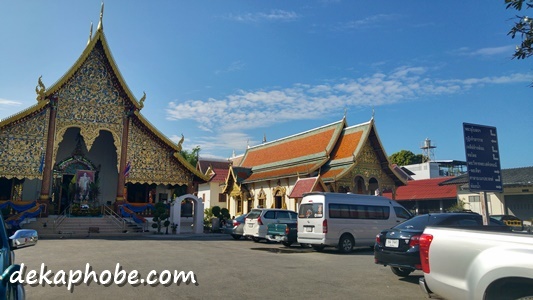 The most popular temple in Chiang Mai, Wat Doi Suthep, is located on the top of the hill, so you will need to hire a songthaew or red truck to get to Wat Doi Suthep. 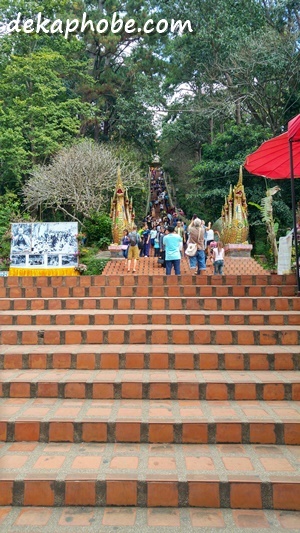 To get to the temple, you will need to climb 309 steps or ride the elevator. During my visit last year, I took the elevator, but this time, I took the stairs going up and down the temple. 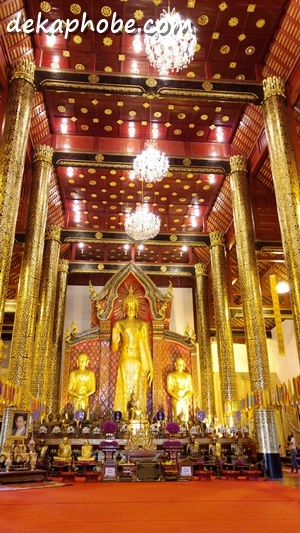 You will need to remove your shoes to climb up the main temple, where there is a mix of visitors and worshipers. It can get quite crowded as the main temple is not that spacious but it is a must-visit. If you're driving up to Wat Doi Suthep, you may also want to drop by Bhubing Palace, a royal property located near the temple. 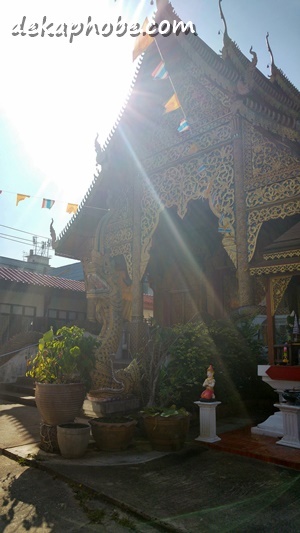 Located near the Chang Phuak gate is the Wat Lok Molee, one of the older temples in Chiang Mai. It has one of the bigger chedis among the temples we have visited and one of the most spacious wats too. You can watch Thais pour water to the top of the chedi as a symbol of worship. 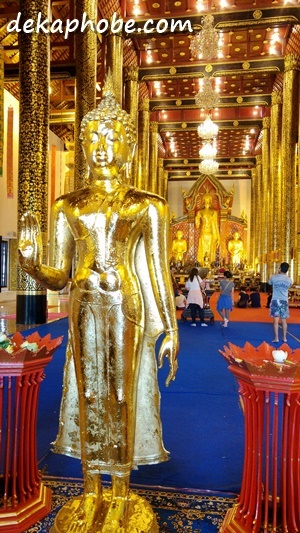 You may also visit the Street Food Night Market in Chang Phuak Gate when you visit Wat Lok Molee. 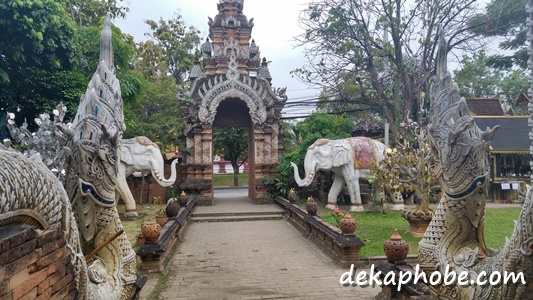 These are only a few of the temples you can visit in Chiang Mai. 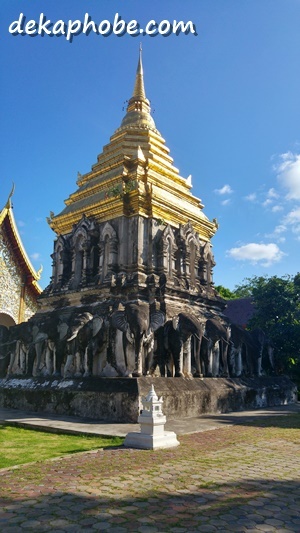 There are several temples that we weren't able to visit, but we would love to visit when we return to Chiang Mai.